I'd been curious about Tre Venezie for a while now, ever since it received its Michelin star in fact. It'd always struck me as a low-key, homey type of place, not exactly the kind of eatery to have an étoile bestowed upon it. I finally made it over recently, after having some business to attend to in the Pasadena area. 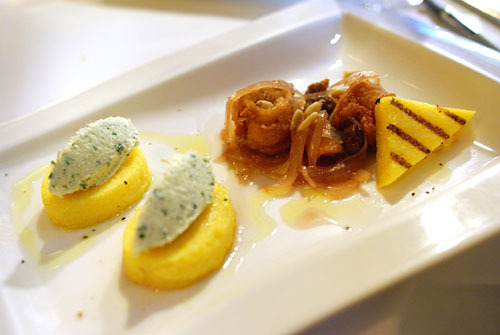 Originally a livery stable, Tre Venezie is a quaint little restaurant, painted a polenta yellow, located on a tree-lined street slight left from the nexus of Old Town Pasadena (tip: enter through the side entrance, not the "front door"). Street parking's the way to go here, and we had no problem finding some on Dayton, just south of the restaurant. From Dayton, we walked up De Lacey and past a Buca di Beppo, where I'd actually dined once after watching the Bruins upset the Trojans at the Rose Bowl. Strolling past Buca, I couldn't help but think to myself how different these two Italians were. Buca di Beppo is, of course, to most Americans the archetype of what an Italian restaurant should be: red/white checkered table cloths, pizza, kitsch scattered 'bout the room, heaping plates of spaghetti & meatballs washed down by bottles of fiasco-enrobed Chianti, and plenty of red sauce of course--the American bastardization of Southern Italian immigrant fare, really. 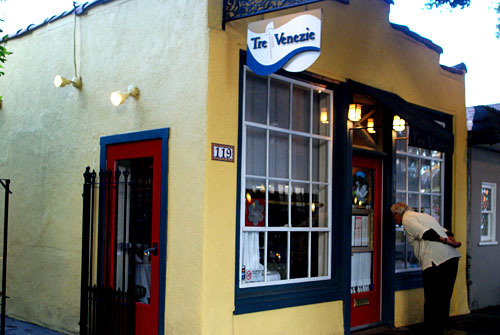 Trattoria Tre Venezie, thus, represents a departure from your standard Italian-American cuisine. 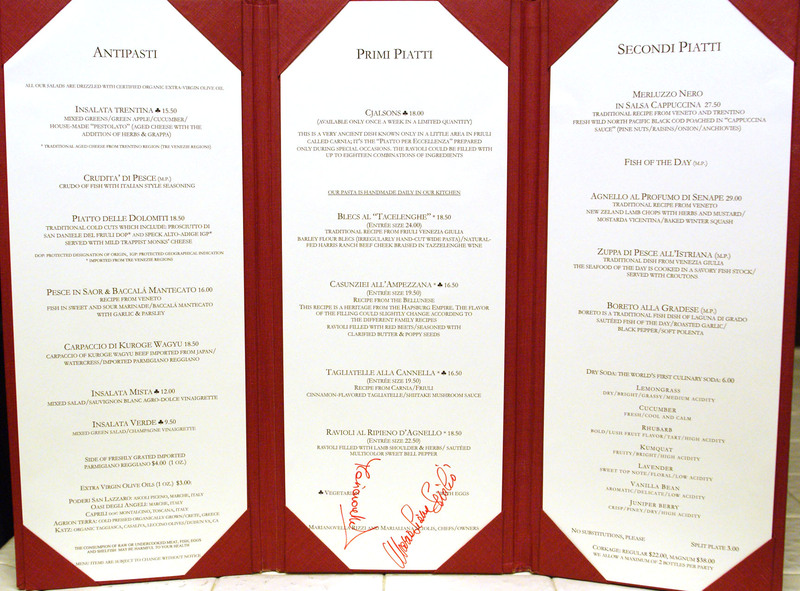 Opened in 1999 by Chef Marianovella Rizzi, Chef Marialiana Sciolis, and Antonio Sciolis, the place highlights the cooking of the Tre Venezie area of northeast Italy, specifically the regions of Friuli-Venezia Giulia, Trentino-Alto Adige, and Veneto. The culinary traditions of the Tre Venezie are unique in the world of Italian cookery. Friuli-Venezia Giulia, for example, borders Slovenia to the east and Austria to the north; as a result, the cuisine of the region shares common roots with its neighbors--items like strudel, goulash, polenta, and Viennese sausage. Trentino-Alto Adige borders Austria too, as well as Switzerland, and also puts forth cuisine with a distinctively Austro-Hungarian tinge. 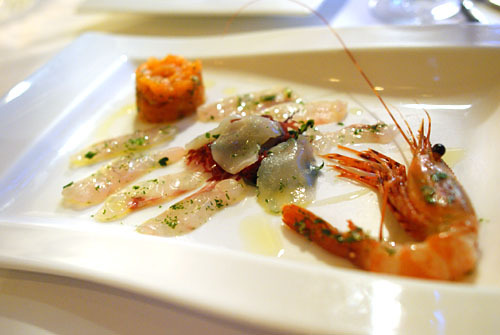 Veneto meanwhile, having long a shoreline, places an emphasis on seafood, and is well-known for its rice-based dishes. 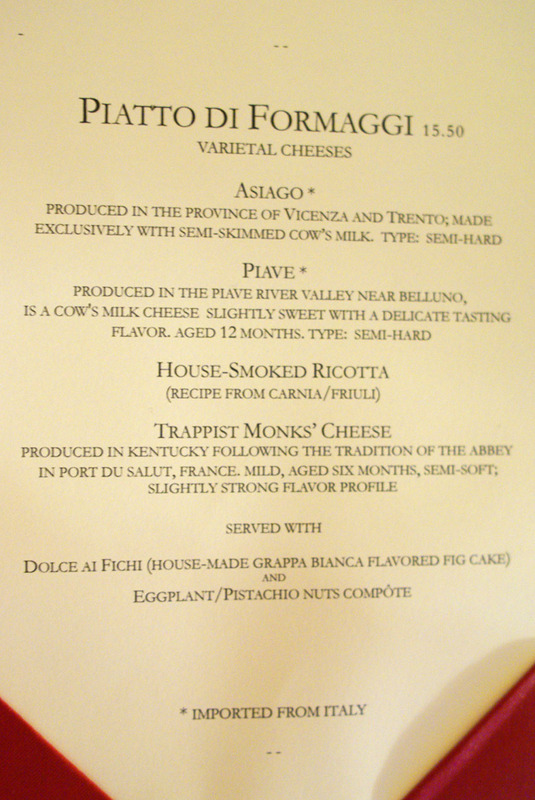 The end result is a menu that's refreshingly different than those of most other Italian places here in the Southland. Inside, things are similarly quaint. It's a small, charming, intimate space, almost home-like in appearance, filled with books, art, and other items of interest. The room is divvied up into a larger space in the back (below), and a smaller dining room up front (above, where we were seated); a small bar brimming with grappa acts as the dividing line. The menu is focused, with nary a red sauce in sight, and changes often depending on what the kitchen has in stock. Upon examining it, I was surprised, and pleased, by the number of dishes that I'd never encountered before--cjalsons? When have you ever seen those before? 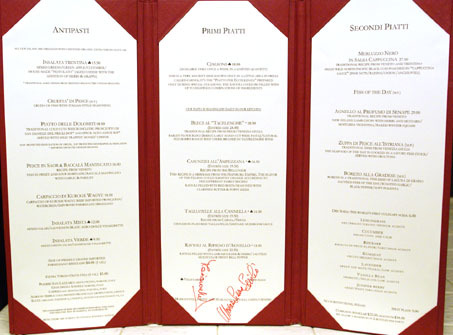 When we asked to have a copy of the menu to take home, we were given not only the menu, but its accompanying binder; the last time that happened was at Zengo in Denver, and there we had to pay $35 for the privilege! Click for a larger version. We were thinking of something bubbly to start, and since Tre Venezie features sparkling wines from its eponymous region, the non-vintage Ruggeri Prosecco di Valdobbiadene Cartizze [$50] was an easy choice. It hails from Cartizze, a 1000-ft hill of 100 hectares, divided amongst 140 producers. 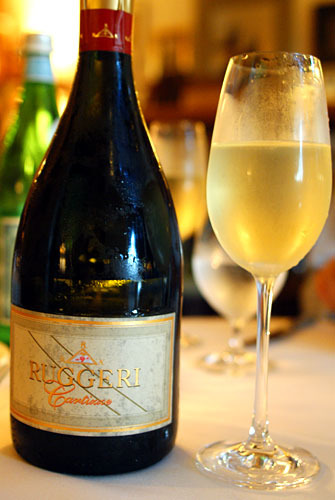 Due to the area's unique morphology and microclimate, the Prosecco made at Cartizze is considered the finest in all of Italy, and the Ruggeri was certainly no exception. We loved its gorgeous effervescence, its elegant, medium body, and its juicy pear- and apple-tinged flavors. 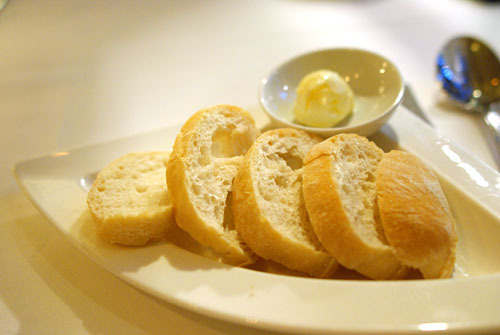 The bread looked drearily unimpressive, but was immensely, and strangely satisfying--perfect crispy/creamy texture, and wonderful with the butter. We went through several plates of it. Our first course was crudo, which seems to be all the rage these days. Basically a dish of raw seafood dressed with Italian seasonings, it originated in seaside towns in Italy. Tre Venezie's selection of seafood changes periodically, but on this night included salmon, scallop, branzino, and prawn. I first tried the scallop, and really enjoyed how the mollusk's natural sweetness interacted with the brininess of its seaweed accompaniment. Next came the branzino, my favorite of the quartet, with a lovely snappy texture and delicate flavor heightened by a delectable herbal finish. Third came salmon, in tartar form: very tender, mild, and delicious. Finally was the prawn, uncommonly fresh, with a luscious, creamy flesh and subtly sweet flavor that well superbly with a bit of lemon. This was two dishes in one. From Veneto was the pesce in saor, a preparation of fish (traditionally sardine or anchovy) in a sweet and sour marinade (vinegar, raisins, pine nuts, and eggplant), dating back to Roman times. Interestingly, the escabeche-like dish originated from two sources: sailors, as a way to preserve fish without refrigeration; and Italian Jews, to observe the prohibition against using fire on the Shabbat. The example here had an expectedly sweet/sour tang, one that was almost Asian in character. Now, the baccalá mantecato. It's a dish consisting of stockfish, commonly cod, that's boiled and beaten to a paste, mixed with olive oil, then seasoned with garlic and parsley, and served on bread or polenta, as was the case here. The result is a creamy, herbal-y, yet delicate spread, with a fascinating texture to boot. The story of carpaccio is a relatively recent one. 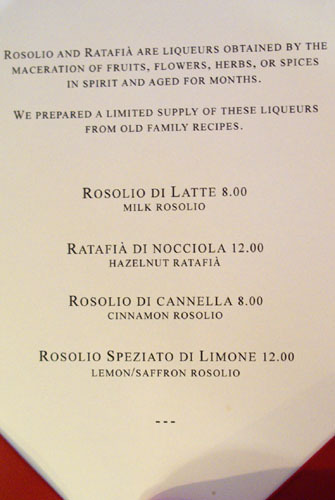 According to folklore, the dish was actually invented in 1950, at the legendary Harry's Bar in Venice. Supposedly, a customer request a dish with only raw meat; the restaurant prepared it, and the carpaccio (named by bar owner Giuseppe Cipriani after Venetian painter Vittore Carpaccio) was born. 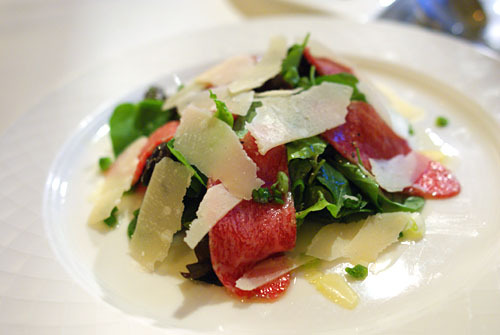 The example here utilized Kuroge Wagyu beef from Japan, watercress, and Parmigiano Reggiano. The beef was supremely marbled, as can be seen above, and was delicious even on its own. However, the bitterness of the greens really helped cut the beef's fattiness, while the citrus-based dressing contributed a lovely tang to the dish. My only concern was the cheese, which, when taken in larger quantities, could actually dominate and mask the flavor of the beef. As pasta is not as popular in Tre Venezie, bigoli is actually one of the few indigenous pastas that have originated from the region. 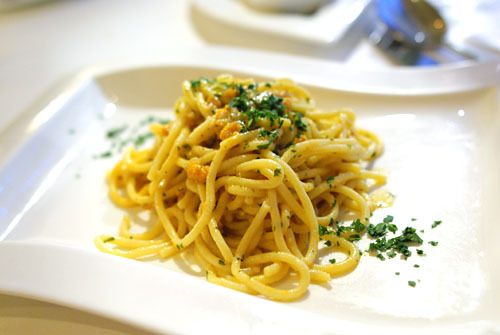 Think of it as the thicker, rougher brother of spaghetti, ideal for seafood sauces that tend to stick to the noodles. The bigoli were topped simply with an uni reduction, which I could smell across the table--talk about a fierce, briny, heady, intoxicating aroma! The taste was similarly strong, and scrumptious, with an almost clam-like savor that permeated the firmly-done noodles, offset by a slight herbal twang. Very good. Another pasta that I hadn't had before was the blecs, derived from Slovenian word bleck or "piece of cloth". It's a specialty of Friuli-Venezia Giulia, and consists of irregularly-cut swaths of barley flour (farro, or spelt) pasta, topped with a ragu of Harris Ranch beef cheek that's been braised in Tazzelenghe wine. 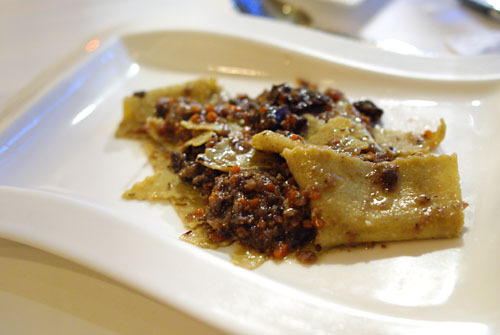 The beef's rich, savory-sweet flavor was tempered by the firm sheets of pasta, making for a very enjoyable experience. 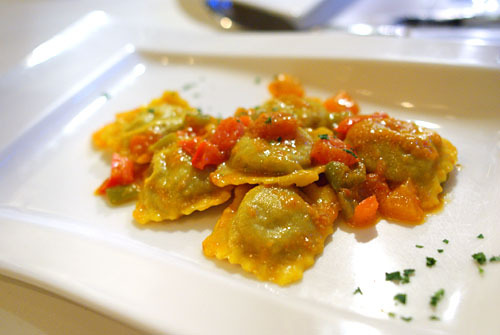 For our final pasta, we went with something a bit more common: ravioli, filled with lamb shoulder and herbs, served with a sauté of multicolor sweet bell peppers. The lamb was full of flavor, absolutely delicious actually, and was perfectly countered by the lovely tang of herbs; I would've been happy eating the ravioli just by themselves. Though unnecessary, the sweet peppers did add a bit of variety into the mix. 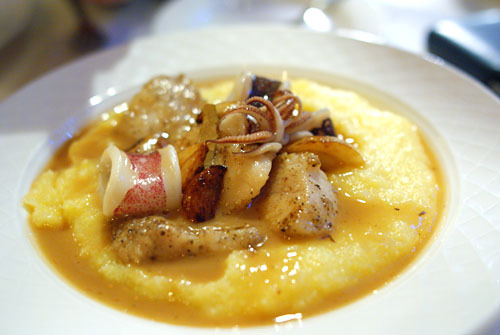 Our final savory was the boreto, a traditional dish of Laguna di Grado consisting of sautéed fish (cod here) and squid with roasted garlic and black pepper, all over a bed of soft polenta. The result is a salty, garlicky presentation of cod, with a distinct peppery component. It would've been a touch overpowering on its own, but paired with the mild, tempering polenta...the combination was magical. I also loved the buttery, super-tender consistency of the fish (I didn't need to chew), as well as the crunchy, sweet-tasting squid. This dish didn't seem like it should work, but it did, in spades. 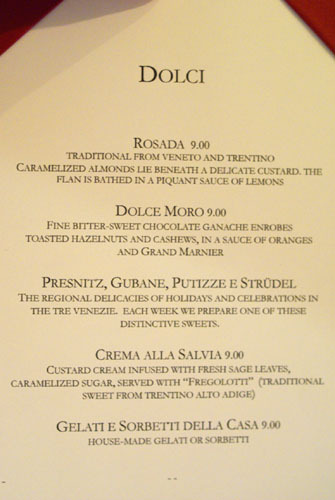 Above, we see the dessert selection, which, like the rest of the menu, was not what we were used to seeing; click for larger versions. 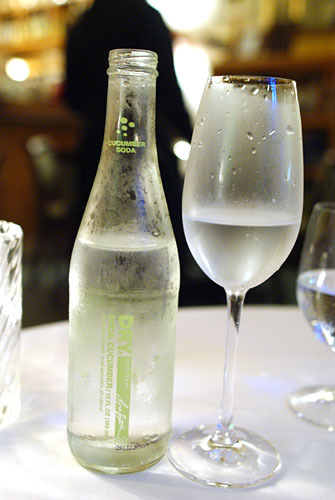 To drink, we ordered up a bottle of Cucumber Dry Soda [$6], a "culinary soda" supposedly; I found it sweet with a cool cucumber taint--quite refreshing really. The next libation was much more interesting. It was the Rosolio Speziato di Limone [$12], basically a sweet liqueur stepped in lemon and saffron, popular with the Venetian aristocracy back in the 18th century. It was a pungent, astringent affair, and I definitely didn't love it. 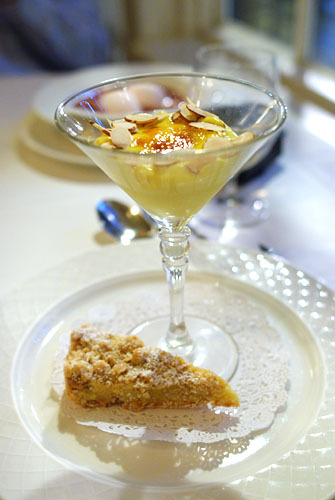 Our first dessert was the Crema alla Salvia, or a sage-infused custard cream, with a caramelized sugar top, drizzled with almonds, served with fregolotti (a traditional sweet from Trentino-Alto Adige). 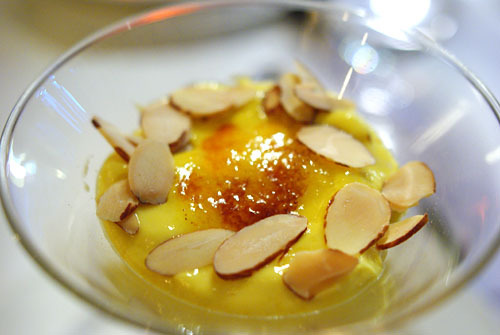 The crème brûlée-like custard was expectedly sweet, but with a delightful herbal tang and an almost savory finish; it reminded me of the Butterscotch Budino at Pizzeria Mozza. The fregolotti, meanwhile, was very firm in texture, but had a lovely, nutty sweetness that went swimmingly with the custard. 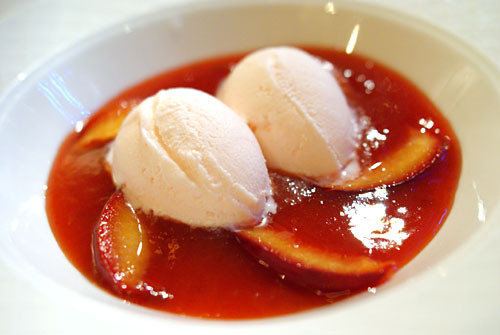 I pretty much never order gelato at Italian restaurants, but the yogurt and rosewater version here convinced me to. The testicularly-shaped gelato itself was sugary, but with a fantastic tart, acidic, yogurt-y tinge. It was nicely balanced by its jammy syrup accoutrement, and the whole amalgam reminded me of LudoBites' "Strawberry Soup Marshmallow Ice Cream Wasabi." We thought that we were done at this point, but owner Antonio Sciolis brought out a complementary tasting of Tre Venezie region grappas for us to enjoy. Starting from the front, the first was an Amarone grappa, made from distilled Amarone must; it had a woody, earthy sapor and a hot finish reminiscent of Port. 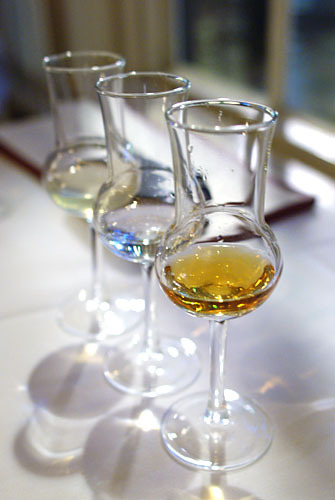 Number two was a cherry-infused grappa, a lighter grappa with a distinct cherry overtone. 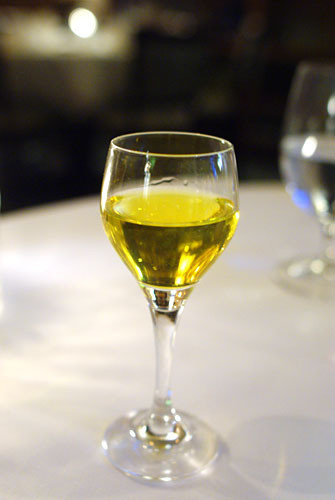 Last was a basil and honey grappa, which had an herbal, almost gin-like character--basil with a honeyed backbone--and a viscous, soft complexion. To pair with the grappas, we were also brought two pieces of the Dolce Moro from the dessert menu. 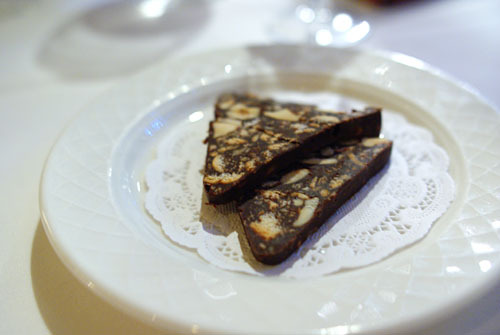 These were bits of hazelnut and cashew, enveloped in a fine bittersweet chocolate ganache: sweet, but not too sweet, with a fantastic nutty accent. This was at its best when consumed with the cherry grappa. 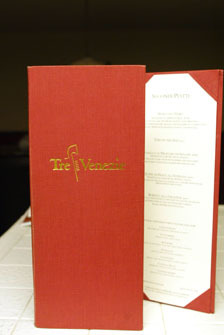 I walked out of Tre Venezie very satisfied. I can't say for certain if the dishes I had were strictly authentic northeast Italian (though they certainly seemed so), but I can say that the cooking I experienced was honest, personal even, hearty and heartwarming, yet subtle, refined, and delicate. It's Italian, but so different compared to all the other Italian places I've been to. This is a meal that will stay with me--red sauce will never be the same. This one really resonated with me. I have to get to Pasadena. love the decor... could feel transported back to Italy! Andrew: Any particular reason for the resonation? Jo: The decor was perfect for the type of restaurant it is. Have you been here? Willy: Sigh, yes, those are the cjalsons that we missed out on. Anon: Thanks! Yes, this is all done for free, so to speak. I certainly don't make any money from the blog, though I do get the occasional free meal. It's a hobby, and as of now, I don't have any intentions of turning my interest in food into any sort of profession. As for advertising, I've been approached by advertisers, but it's just not worth it at this point. What kind of CPM would I get? $5 maybe?